Part I: Will they have money to spend? With a couple of long-term contracts coming off the books, it appears the team will have more of a budget for free agents than they have in several years. Currently, their payroll sits at $93 million, according to Cots. $15.125 million of Jason Bay’s salary and $20 million of Johan Santana’s salary will come off the books after this season comes to an end. David Wright will get a $9 million raise in 2014, and Jon Niese will get an increase of $2 million. So, according to my admittedly limited math skills, the Mets should have an extra $24.125 million that they didn’t have last offseason. The big question is, how much of it, if any, will they spend on players? Back in Spring Training, Mets owner Fred Wilpon declared an end to the Mets money woes. However, it’s hard to trust Wilpon when he talks about money, based on history. Back in 2008, when the Madoff scandal first broke, his son, Jeff (Also, the club’s COO) claimed their losses would have no effect on the team. That assertion turned out to be dead wrong. Since the Mets signed Jason Bay prior to the 2010 season, the Mets have not inked a major free agent. They’ve shopped in the bargain bin to fill out their roster. Their payroll went from $149 million in 2009, all the way down to its current sub-$100 million dollar state. And they don’t plan to take it back to those levels anytime soon. U.C.C. filings confirm that the $320 million debt due against the team in June 2014 is an active debt. 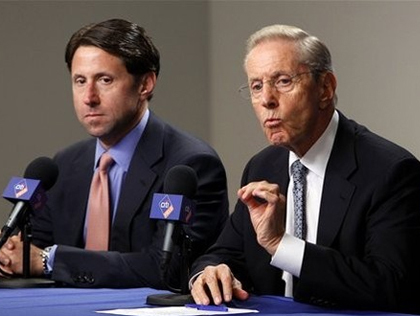 And Wilpon and his partners already owed $450 million against their 65 percent ownership stake in S.N.Y., due in 2015. Their latest loan, an additional $160 million secured in December, added to that total. That’s why it’s easy to doubt that the Mets will be bigger spenders this year, despite the money coming off the books. When it comes down to brass tacks, however, the only people who know the true state of the Wilpons’ finances are the Wilpons. Part II: If they have money to spend, who will they spend it on? The Mets need bats. A power bat, particularly in a corner outfield spot, is something they desperately lack at the moment. Lucas Duda has some pop, but not as much as some expected he would (or at least, it appears that way at the moment), and Ike Davis’s long, hitchy swing all but guarantees dramatic inconsistency at the plate. When David Wright is healthy, he’s a 25-homer guy, but mostly a gap-to-gap hitter. But the Mets haven’t had a consistent, reliable cleanup hitter in several years. The bad news is there aren’t going to be many of them available on the free agent market. The player who probably fits that bill the most will be Hunter Pence. He rebounded from a subpar 2012 (.743 OPS, despite 24 homers), to a more Pence-like .845 OPS this year. His 162-game average of 25 home runs would be fine for the Mets. The uncertainty lies in his age (31 next year) and how much money he’s looking for (he’s currently on a 1-year, $13.8 million contract with San Francisco). Another name that continues to be strongly linked to the Mets is Shin-Soo Choo. Choo currently is the center fielder for the Cincinnati Reds, but is a better corner outfielder, which is probably where Choo would end up, should the Mets grab him. Choo is a high On Base Percentage guy (.422 this year) with some pop (162-game average of 20 home runs, 21 home runs this year, playing his home games in a hitter’s park) and some speed (average of 20 stolen bases per 162 games). Ideally, he’d be a leadoff guy, which the Mets also need. They like Eric Young, Jr., but they see him more as a fourth or fifth outfielder going forward. If they can’t get Choo, they may go after Jacoby Ellsbury, who’s hitting .299/.355/.424 with 52 stolen bases this year. Ellsbury would be a good fit for Citi Field, but his injury history is suspect. With Ruben Tejada taking a step back this year, the team also has a glaring need at shortstop. Either Yunel Escobar or Jhonny Peralta would be an upgrade, but each carries significant baggage. The Mets found success this year with former PED-user Marlon Byrd, but they only had to pay him $700,000. A guy like Peralta would probably require a larger salary. Depending on whether or not Matt Harvey will need Tommy John surgery (which we should find out this week), the Mets may choose to pursue a veteran starting pitcher, which was suggested by GM Sandy Alderson himself on a recent radio interview. The Mets have a core of hard-throwing, young starting pitchers like Zack Wheeler, Jon Niese, Dillon Gee (more finesse than hard-throwing), and Jenrry Mejia, with more on the way (Rafael Montero and Noah Syndergaard should make their debuts at some point next year). Any pitcher Alderson acquires will probably be a stopgap, like Shaun Marcum, Daisuke Matsuzaka, and Aaron Harang were this year. Some speculate that Alderson could take a cue from the Boston Red Sox and sign several mid-level free agents rather than going for the big splash. That would be especially important since injuries are a fact of life, and the Mets need depth. But it seems like all of the free-agents-to-be are mid-level this year. Players like Ben Zobrist, Byrd, and Kendrys Morales could end up making more than they’re worth. Not that they’re bad players, but it’s shaping up to be a seller’s market out there. One thing we know, Alderson despises long-term contracts, but views them as a necessary evil. We also know that long-term contracts, even if they make sense at the time, can strangle a ballclub in the long run, especially if they were paid for with money the team really never had (See Part I). The Mets could look to trade for a front-line bat, but the farm system, while improving, still isn’t deep enough to “trade from strength.” Would you want to trade a Syndergaard or Montero with the possibility that Harvey will miss most or all of 2014? There are several factors that will determine how aggressive the Mets will be this offseason: Harvey’s surgery, how some of the young players finish out this season, and how much spending money the team really has. While the team is in a position to improve, no one is under the illusion that the Mets are one of those clubs that is a piece or two away from a World Series in 2014. With that in mind, the Mets will probably not be inclined to overspend or give up too much in a trade. But if Fred Wilpon is telling the truth about his bank account, the Mets will at least be more active in the free agent market than they have been in the post-Madoff era. Next Who is Next Year’s Matt Tuiasosopo? You clearly pointed out how Fred and li’l jeffy have been less than accurate about their intentions in the past. * History is a great teacher. *I rewrote this sentence a number of times, otherwise I’d be using terms that Izzy is much better at than I am. PS–next time you choose to use a picture of Fred, please try to crop out the juvenile next to him. The Mets should give Jeff Wilpon a raise to prevent another team from hiring him away as their COO. The Mets could do a lot of things, but since they are keeping a GM that has failed to improvevthevteam in three years, that is still evaluating Lucas Duda after almost three full seasons, that heralds the arrival of such stars as Cowherd and Hu, whose big free agent sign was fat Frankie the worst closer in team history, you should probably hope he does nothing, as he has no more stars to trade and no teams looking for rentals for the next ten months. Is this acceptable Verbage Norm? No disrespect meant Izzy, but I don’t want you to repress your feelings. Your point of view, sometimes expressed in over-the-top language, is often quite valid, and always interesting. My advise, obviously not sought after, is that you shouldn’t let the verbiage get in the way of the message. As Paul points out, we can all speculate about the debt but no one knows except the ownership. Even with $1 billion in debt, the hold assets worth over $2 billion. The only financial solution to stop the losses is to increase revenue, and the need a better product to increase revenue. Bottom line is they need a major influx of talent in 2014 or they will continue to lose revenue. The will have a base payroll around $50 million next year when adding contracts and arb eligible players. That leaves a bundle to spend on improving the talent level. If not, and with Harvey in continued limbo or out, they will not even draw 1.5 million next year, and no one will watch SNY. They really have no other choice but to spend their way out of this mess. 1. Alderson: Was hired about the time the Madoff-Impending doom story congealed. 2. Subsequently the Mets have not spent. 3. Subsequently the gate receipts have crashed. 5. Subsequently expectations have been replaced by transparent promises. 6. Subsequently the urge to post what I would like to see happen has been replaced by ambivalence. Article is a nice piece, been a Met fan 40 yrs. And they ain’t going to change! Once every 20 years, you will get a gleemer of hope. We are overdue last glimmer 1986! Really 2000! Anyway, lets get to business. They can do allot. So let me map it out! team is set here 3b, 2b, 1b, c, cf ! Stop moving Lagares and leave him in CF. Murphy is good enough 284, 15, 70rbi’s is good for second. And either Duda od Ike at first! Now we trade Davis, Tajeda, Montero and another hot prospect for Gonzo from Colorado. Revisit Bryd for 5 mil, sign Escabar for shortstop and the team is competitive. Revist Santana for 8 mil, he has the work ethic!!! This is why we go there and he owes us!!! So If HARVEY DON’t COME back. We start here Niese,Wheeler,Santana,Gee, Synagaarad,Mejia,Famuliar,Feliciano,Black,Byrdak, Parnell, Hefner. Flores,VLADY,Turner,Young off thr bench. All that for 87 million. Wow NOT BAD! Put your damn hat on now AlderSON!!!! Time to make that 20 year move!!!!!!!! ovan: I cant believe it but most of what you said I agree with. EXCEPT, Dan Murphy gets traded for me. I would have Turner as my 2nd baseman over Murph. I might keep Ike or Duda or trade both. If I could do a trade, I would try for Hanley Ramirez.